A lot of people associate mice with eating cheese, but we know that for optimal health their diet should contain much more than this. Mice are omnivores, so they need a variety of different nutrients in their food. By giving your pet mouse a proper diet, you'll be helping it live as long and healthy of a life as possible. 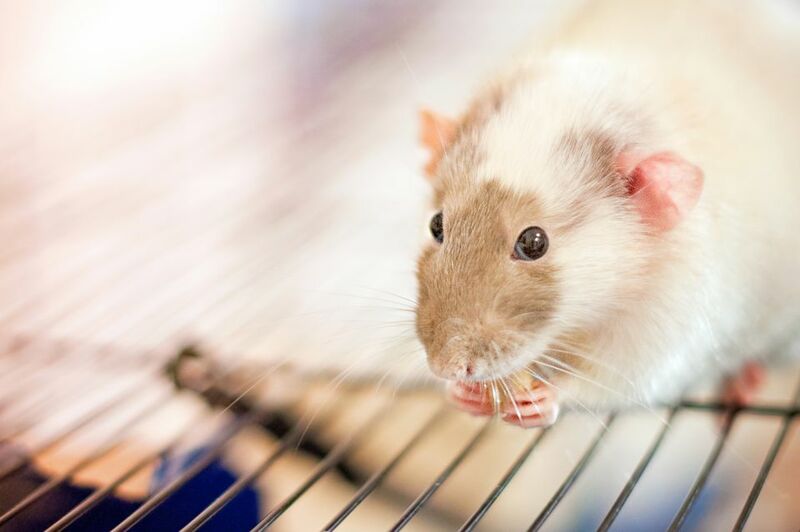 Mouse/rat pellets - Originally designed for laboratory mice and rats, rodent pellets or blocks contain the necessary vitamins, minerals, protein, and other essential nutrients that mice need. These are hard, brown blocks that are usually rectangular in shape. They are good for keeping your mouse's teeth trim as well as providing the bulk of nutrition that a mouse needs to stay healthy. Fruits - Mice enjoy and can eat a variety of different fruits. Some mice will develop preferences to certain items, but you can offer your mouse apples, pears, bananas, melons, peaches, plums, oranges, and berries just to name a few. Vegetables - There are also many fresh vegetable options that can be fed to mice. Broccoli, cabbage, Brussels sprouts, endive, carrots, bok choy/other Asian greens, celery, parsley, corn, beans, peas, and tomatoes can all be used. Minimal dietary requirements are not the same as optimal dietary needs, so what is recommended for a laboratory mouse is most likely not what a pet mouse needs. There is unfortunately little research though that has been done on feeding a mouse for longevity and not just short-lived research purposes. Per available research, mice are typically recommended to receive about 2 grams of potassium, 3 grams of phosphorus, 5 grams of calcium, 0.5 grams of sodium, 180 grams of protein, 35 milligrams of iron, 10 milligrams of manganese, and a variety of other vitamins and minerals per kilogram of food. The fat content of the food you feed should be around five percent, similar to the requirements of a rat. Seed mixes are routinely sold and used to feed mice, but a mouse will typically pick out its favorite items and not eat everything it should. These mixtures often have pellets or blocks and dried fruits and vegetables in them, but because the seeds are more appealing and tasty to a mouse, they'll avoid the things they should be eating and only eat what they want. This is why seed mixtures are not recommended for pet mice. Seeds should only be offered as a treat. Fresh, clean water should also be provided to a mouse at all times. The fruits and vegetables will offer some hydration but a water bowl and/or bottle should also be available. Many mouse owners will simply fill a bowl with mouse food and refill it as necessary, but this is not ideal. A small bowl or plate with fresh food should instead be offered daily. Each day the uneaten food, especially the fresh fruits and vegetables, should be discarded to prevent your mouse from consuming spoiled food. A few large blocks or a small handful of pellets should be ample food for daily consumption of one mouse, in addition to a small amount of fruit and vegetable pieces. Allow your mouse to have some variety and rotate what types of fresh foods it eats. An occasional treat of cereal, seeds, or crackers are okay to offer, especially if you are trying to hand tame your mouse, but these should not be more than 10 percent of the daily diet. Research has shown that a typical adult male mouse will consume about 3 1/2 to 4 grams of food (about the same weight as a teaspoon of sugar) and around 100 calories each day. These requirements will vary greatly though depending on your mouse's genetics and activity level as well as the food you feed. If your mouse is pregnant, nursing, or still growing, the food requirements will also likely increase. Despite the fact that mice may willingly eat something, there are foods that are not ideal for a mouse to consume. Foods high in fat and sugar may be popular with your pet mouse but they are very bad for them. Candy, cookies, peanut butter, chocolate, and bacon are just a few examples of foods that should not be fed to mice. Some people will offer very small amounts of cooked pasta or bread, but cheese isn't usually a favorite food among mice, despite the popular belief.